I love reclaimed items which can be repurposed to be something else. Here’s a brilliant way to take old bowling alley and make something beautiful and functional. These Counter Evolution reclaimed wood dining set are stylish and can fit into many different types of designs from urban to more rustic settings. According to Uncrate, the original source which I found this gem, “the Gutterball Table is the perfect centerpiece for your Lebowski-themed home”. So could also work in a bachelor pad. A bit of a splurge with price point between $2,320-$3,580, however; it’s really hard to find a piece of furniture that is not made out of MDF or compressed wood, and this set had an added advantage of having a sense of history behind it. Not to mention it is all handcrafted as well. 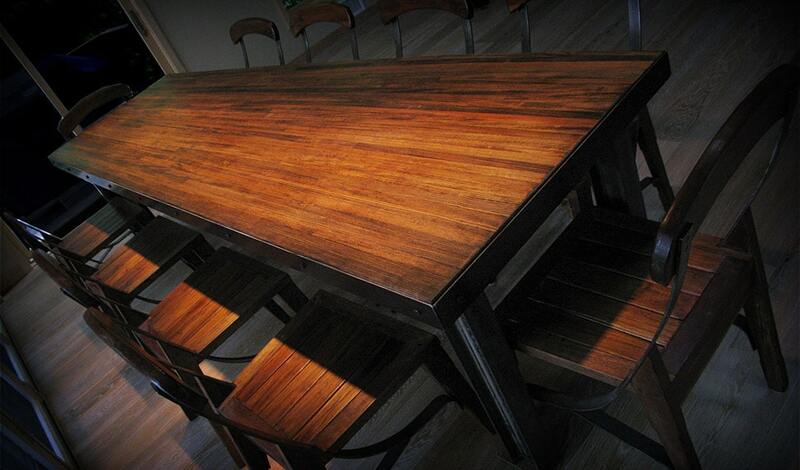 The reclaimed wood dining set is made by Counter Evolution which is based in New York City. Started in 2004, Counter Evolution prides itself in providing sustainable options to residential and commercial abodes. Major companies like Starbucks, Sweet Green, and green minded homes are already a fan.